Elroy E. Friede of Juneau, passed away Saturday, December 1st, 2018 at the age of 95 comforted by his family at his side. 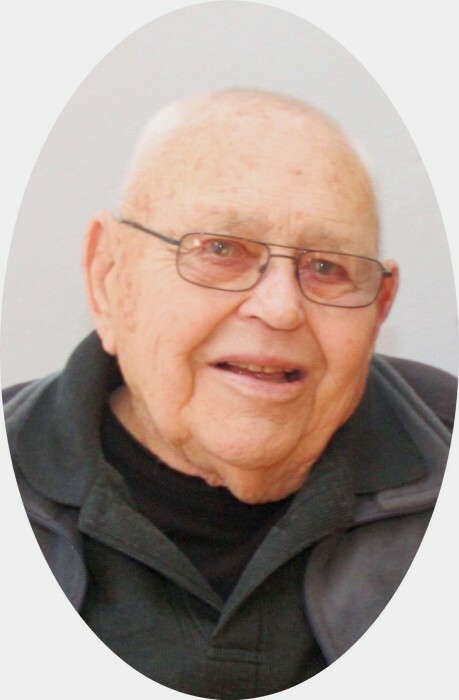 He was born July 24, 1923 in Mequon the son of Reinhold and Lydia (nee Lemke), Friede. Elroy was baptized and confirmed at Trinity Lutheran church in Freistadt. Elroy was married on April 26, 1947 to Ruth Zarling at Immanuel Lutheran church in Cedarburg, WI. During their 71year marriage he shared a strong Christian faith with his family. There were many camping trips while the kids were young. After retiring from Dodge County Highway Department, he and Ruth traveled to Germany and many of the United States including Alaska and Hawaii. His interests varied from farming, gardening and card playing to investing and inventing. He loved to make improvements to anything he owned or purchased. preceded in death by a brother, Franklin Friede and sister, Doris Fick. Visitation is Thursday, December 6th 2018 from 10-Noon at St. John’s Ev. Lutheran Church in Juneau, WI. Funeral service will follow at church at noon. Rev. David Brandt will officiate. Interment Juneau city cemetery. The family would like to extend a thank-you to Harbor Village of Greendale for providing a comfortable home and care since October 2017. Also, a special thank-you to the Grace Hospice for their kindness and support. The Berndt-Ledesma Funeral Home, Juneau is serving the family.